The laundry room has become the hottest room in the house to decorate. I don't think that any laundry room has been pinned or posted more than this one. Since I actually saw it in the flesh and was the first to post on it to my knowledge, I thought everyone might enjoy more details on it for inspiration. *The room was in the Washington DC Design House in Spring of 2009. The house was a former rectory in Georgetown. *The designer was local designer Draza Stamenich. He started as a window dresser for Bergdorf Goodman and a visual stylist for Neiman Marcus. *It was the tiniest room of the house by far, just the little nook you see above. *It was my favorite room of that show house. 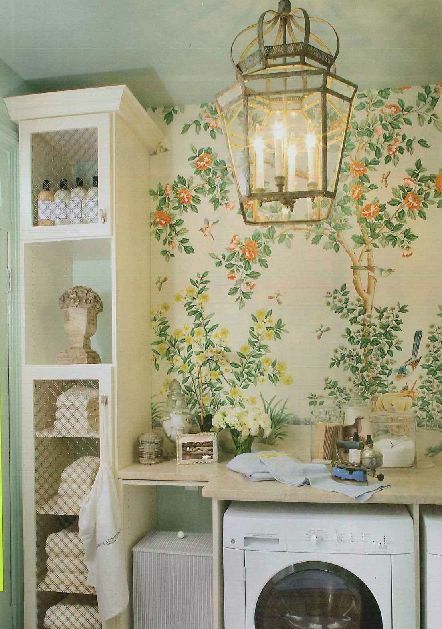 *The walls are papered in Gracie. *The cabinets are faced with aviary wire. *The chandelier is Neirmann Weeks. *He used prismatic chandelier bulbs. This is where I got the idea for these bulbs and they are all I use in my chandeliers. *The washer and dryer are classic white from GE. The designer said he finds colored washers and dryers tacky, preferring white or stainless. *He brought in lovely antique garden accessories. 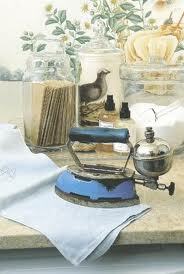 *Laundry products are high end and on display like those available now from The Laundress or The Good Home Company. *Glass jars from The Container Store hold powdered laundry detergent and dryer sheets. I have hunted down more shots of the room, to give you more details, although not all are of the highest quality. Well, I now that I have died and gone to heaven, the day that I can afford Gracie in the laundry room! Think this needs to happen in my laundry room this weekend. I'm not springing for Gracie in the ol lint palace, but I'm betting I can free hand a reasonable facsimile! 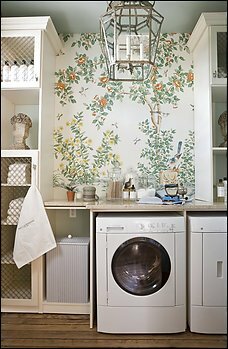 Love this laundry room -- mentioned you in my blog this week!! I wouldn't mind spending sometime in this laundry at all, maybe a little drop down desk to work on my blog if there is room??? 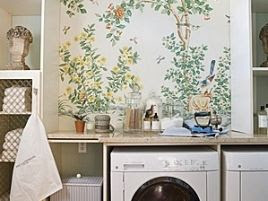 I have always loved (and coveted) this laundry room... thank you for sharing the additional shots!